Create cool fashion accessories wtih this unique button bracelet maker. Includes over 100 buttons and 10 straps…. Create endless new looks with the Button Bracelets design kit. Making your own unique jewellery has never been so easy thanks to these clip-on fashion accessories. Choose from 10 different coloured bracelets then clip on your choice of over 100 buttons to make your own design. The buttons clip off the bracelets just as easy, so you can create new ones to match any mood or outfit. 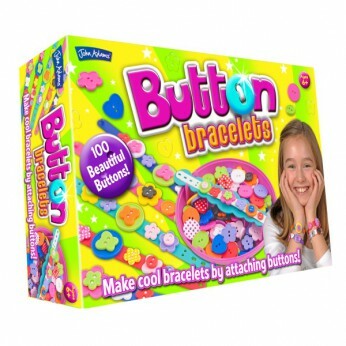 The set also comes with a button-shaped storage case that doubles as a handy work station.Make groovy button bracelets with 10 straps and over 100 brightly coloured buttons! Share them with your friends as friendship bracelets! This toy costs approximately £6.99 (for the latest and best prices make sure you check our retailer list for the Button Bracelets above). In our review of Button Bracelets we classed it as being suitable for ages 3 years, 4 years, 5 years but recommend you check the manufacturer specific advice before purchasing.